'We are actually studying ... how we can ensure our students are safe at school," Betsy Devos tells a Senate subcommittee. DeVos’ testimony to a Senate subcommittee came amid criticism by Democrats and some educators that the panel, set up by President Trump in March, was focused more on distracting public attention than truly addressing gun violence. DeVos also skirted Leahy’s question on whether she believes an 18-year-old high school student should be able to purchase an AR-15 assault-style weapon, which has been used in many mass shootings. “That’s very much a matter for debate,” she said. DeVos has said the commission aims to produce a report on best practices by the end of the year, but other than that the department has disclosed little information about the panel. She said Tuesday the panel will examine 27 issues surrounding school safety. She did not elaborate. Trump created the panel after the February shooting at Marjory Stoneman Douglas High School in Parkland, Florida. Seventeen people were killed. DeVos also was grilled on the fate of undocumented students and whether principals or teachers can call immigration authorities about them. DeVos had faced criticism from rights groups after suggesting last month that whether to report such students was a matter for local schools and communities to decide. 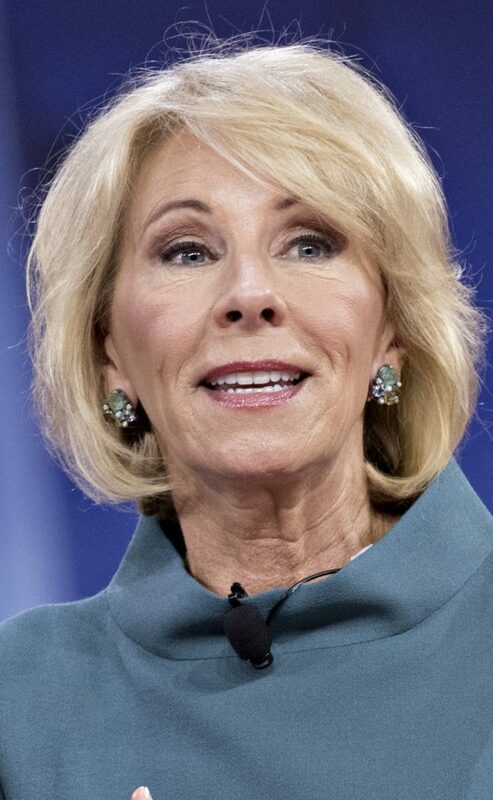 In her testimony Tuesday, DeVos cited the 1982 decision by the U.S. Supreme Court that students are entitled to public education regardless of their status.